Looking to see if anyone has any experience or knows anyone that has instal the Eibach RSB to get there thoughts. Picked one up cheap a few months ago and now thinking I might want a 22MM bar instead. Any thoughts would be great. 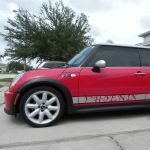 I haven't installed the Eibach RSB, but I have installed 2 RSB's on R53's. Definitely want to use a lift, or at the very least, jack stands to elevate the sucker. It's much easier to wrangle the bar into position when the car is elevated. Other than that, some sturdy tools, a set of instructions doesn't hurt (although as you remove the stocker, it's pretty clear what needs to happen), and make sure you have proper lube for the bushings. If the one you got cheap was used, you may need to go grab that. It's not very difficult, overall, if you have average suburban male competence with hand tools. Different bar but same process. If you are more of a visual person like me you may want to check out the video that Madness Motorworks did for installing their 22mm bar. The install is the same no matter what size.